To obtain a more youthful appearance Laserase Croydon can offer treatments with Intense Pulsed Light (IPL), long pulsed Nd:YAG, Er:Yag laser systems and injectable treatments using BOTOX, dermal fillers and dermaroller . A combination offers optimal results since no one system can remove all wrinkles or signs of aging. For deeply etched wrinkles we recommend laser skin resurfacing using an Er:YAG laser. These advanced high power lasers removes the upper layers of skin revealing the fresher skin beneath. How do laser and IPL treatments work? The short wavelength intense pulsed light system (IPL) produces a broadband light that eliminates superficial signs of ageing, including freckles, broken capilliaries, rosacea and age spots. The light is absorbed by pigmented areas where it is converted into heat, causing break down of pigment. In broken capilliaries and spider veins, the light is absorbed by the pigment in the blood generating heat that collapses the unwanted vein. The long wavelength Nd:YAG laser gently heats up the lower layers of the skin producing collagen that stimulates a healing response. This acts as a new foundation for the skin, reducing wrinkles and improving skin tone. Because both these treatments do not damage the outer layers of the skin, there is no prolonged healing time and normal activities can be resumed immediately. All areas of the body can be treated. It should be noted that fine wrinkles are more likely to have noticeable results than deep wrinkles. All skin types can be treated and skin colour makes little difference to the benefits of the treatment. Rarely redness and irritation of the treated area may occur (like sunburn). There is also a small risk of pigment change following treatment. A small minority of patients develop bruising or blistering. This settles within a few days. A series of 3 to 6 treatments is recommended at monthly intervals. Methods to reduce further collagen breakdown include smoking cessation and the application of a moisturiser with SPF30 sun block. 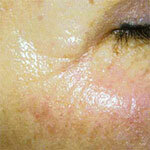 The effects of the treatment may also be prolonged with the use of medical grade skin care products. These will enhance the efficacy of the treatment. It must be remembered that the skin is constantly ageing, so it is envisaged that further treatments in the future may well be desirable. 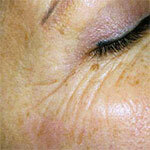 What other methods of wrinkle reduction are available? For deeply etched wrinkles, we recommend laser skin resurfacing using an Er:YAG laser. These advanced high power lasers removes the upper layers revealing the fresher, more youthful, skin beneath. BOTOX injections, dermal fillers and dermaroller can also be employed. Your Laserase Croydon Doctor or Nurse will be able to advise you. Yes. There is no evidence whatsoever to suggest that the treatment can lead to skin disorders or an increased risk of cancer. Furthermore, every precaution has been taken to ensure the safety of the patient. Having met all the necessary conditions, each Laserase Centre is registered with the Healthcare Commission. The lasers are also subject to periodic checks by the Regional Radiation Physics & Protection Service. *Please Note: Prices quoted are per session and are an approximate guide only. The initial consultation is offered entirely free of charge with no obligation to undergo treatment.